Sir Harold Kroto Got His Nobel Prize For Discovering Buckeyballs. But Art Was His First Love He shared chemistry's top prize in 1996 for finding buckyballs, and had Lou Gehrig's disease when he died. Making art was his first love. "Remember your humanity," he said, "and forget the rest." 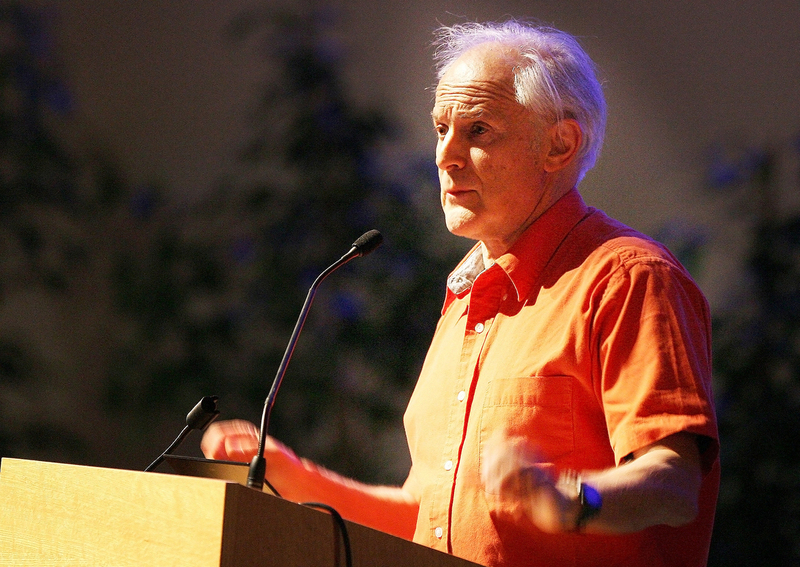 Sir Harold W. Kroto, a winner of the 1996 Nobel Prize in Chemistry, gave a lecture on nanoarchitecture in May 2007, in Brussels. "Find something to do where only your best effort will satisfy you," he advised students. But he was also funny, wise, and devoted to helping the students in the room understand what science — and life — was all about. Harry served on the Nobel panel for three years running, and in 2015 he told me he had been diagnosed with ALS, the disease that killed Lou Gehrig. I had never interviewed him for the radio, and I told my editor, Anne Gudenkauf, that he was a special individual, and we should get him recorded before his disease took away his ability to speak. She agreed, so I flew to Tallahassee for one day, went to his house, and we talked for 2 ½ hours. At times I felt terrible, since he was clearly worn out by his disease, and talking to me was an effort. But whenever I asked if he wanted to keep going, he said yes. When it was time to leave, he stood up, shakily, and gave me a hug. It felt odd, and appropriate at the same time. Our discussions were more than a conversation between expert and reporter. It was one human sharing his perspective on life with another human who felt privileged to hear it. Parts of that interview aired in a radio story I did last fall — with a headline Harry wrote to tell me he abhorred. But I've been thinking since his death about all the things he said that resonated with me — ideals I think I share. I wasn't able to put all that into my radio piece, and I really wanted to give you a chance to hear more from Harry. Please give the audio above a listen. Harry had important things to say to us all.